There are few more colorful and diverse plants than coleus. Coleus plants do not withstand freezing temperatures but cool, shorter days do spur an interesting development in these foliage plants. Do coleus plants have flowers? Coleus plant flowering begins as a signal that winter is coming and the plant should produce seed to continue its genetic dynasty. Flowering often leads to a rangy plant, however, so it is best to learn what to do with coleus blooms if you want to keep a compact, thickly leafed plant. Do Coleus Plants Have Flowers? Many gardeners are charmed by the spikes of tiny blue or white flowers produced on coleus at the end of the season. These little blooms make a charming cut flower or may be left to enhance the beauty of the plant. Once a coleus has flower spikes, though, it may become leggy and develop a less attractive form. You can stop this in its tracks with a little word of advice or enjoy the new display made by the energetic blooms – whatever you prefer. Coleus are often thought of as shady foliage specimens that brighten up the dark corners of the garden. While this is somewhat true, the plants can also grow in full sun with some protection from noontime searing rays. 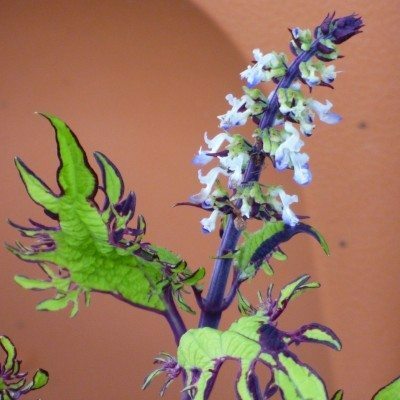 The age of the plant and stress can contribute to the formation of blooms on your coleus. Stress can come in the form of excess heat, dry conditions and late season cold nights. The plant knows it will die if continued exposure to unfavorable conditions continues, so it blooms to produce seed. Coleus plant flowering signals the end of the plant’s life cycle, and plants usually die soon after they are allowed to produce blooms. Flowers are attractive to bees and butterflies and occasionally hummingbirds and add a significant color punch to the plant in hues of blue, white or lavender. 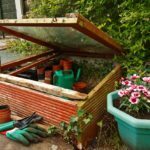 You can just leave them on and enjoy the plant as an annual or take steps to encourage thicker growth and continued life in a greenhouse or cold frame. What you do with the flower spikes is up to you. Leaving the flowers tends to cause less foliar development and leggier stems, probably because the plant is directing its energy to flower formation. You can pinch off the spikes just as they are forming and redirect that energy back into leaf formation while helping create a more compact, thick form. Trim the stem back to the first growth node before the spike forms. Use scissors, pruners or just pinch off the growth on slender stems. Over time, new leaves will sprout from the cut area and fill in the space left by the spike. Alternately, you can let the blooms grow and produce seeds. If a coleus plant has flower spikes, simply wait until the petals fall off and a small fruit is formed. Seeds are tiny and will show themselves when the capsule or fruit splits. Save these in a plastic bag until you are ready to plant them. Coleus plants are easy to start from seed, either indoors or outside when temperatures are at least 65 degrees Fahrenheit (18 C.). Coleus may be started with cuttings or seeds. If you saved your seeds, you can plant them at any time if growing them indoors. 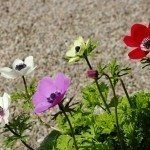 If you intend to use them outside, wait until soil temperatures have warmed up and all danger of frost has passed, or sow them indoors in flats 10 weeks before the date of your last frost. Sow the seed into moistened sterile medium in flats. Cover the tiny seeds with a fine sifting of the medium. 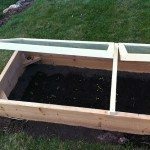 Cover the tray with a plastic lid and keep moist in a warm location until sprouting occurs. Thin the seedlings and transplant them to larger pots when they have two sets of true leaves. Grow them on in containers indoors until outdoor temperatures are at least 65 degrees Fahrenheit (18 C.) and then gradually harden them off before transplanting them to containers or prepared garden beds. In this way, the flower spikes can adorn the plants for added appeal and provide a new generation of the plants for years to come.